February 13, 2018 – As Ahed Tamimi, a Palestinian teenage girl enduring unjust detention in an Israeli prison, begins trial today, major organizations from the Indian women’s movement, representing over 10 million Indian women, demand her release alongside all Palestinian child prisoners. These organizations have also heeded the call by Palestinian women to endorse the Boycott, Divestment and Sanctions (BDS) movement, asserting that endorsing BDS is the most effective form of solidarity with Ahed and other child prisoners. The BDS movement is a peaceful, global human rights movement that urges the use of economic and cultural boycotts to end egregious Israeli violations of Palestinian human rights and international law. It is inspired by the use of political boycotts in earlier movements for freedom, justice and equality, including the South African anti-apartheid movement, the American Civil Rights movement, and India’s movement for independence from colonial rule. Ahed Tamimi’s release has also been called for by major human rights organizations like Amnesty International and in a recent statement by prominent cultural figures and “Dream Defender” activists in the United States. 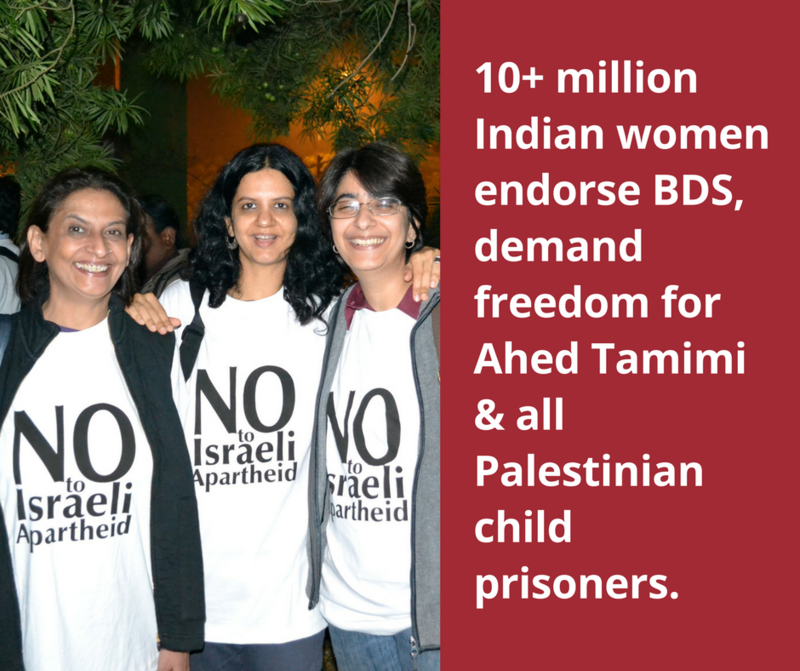 We Palestinians welcome the principled solidarity of India’s leading women’s organizations with Ahed Tamimi, all Palestinian children imprisoned in Israeli jails, and our BDS movement for freedom, justice and equality. This latest expression of solidarity from Indian women is in line with a noble legacy of Indian support for our nonviolent Palestinian anti-colonial struggle. Alongside the millions in India who are calling for an end to deepening ties between the Indian and Israeli governments, we can end India’s complicity with decades of Israeli theft of Palestinian land, colonialism, military occupation and apartheid. We, the undersigned, demand the immediate release of Ahed Tamimi and all Palestinian child prisoners. We further believe that the strongest way to support Ahed’s struggle and the Palestinian quest for justice, freedom and equality is to support the BDS movement. Israeli impunity is built on collaboration of corrupt regimes, and it will be dismantled by the unity of grassroots struggles across the world. Palestinians are leading us by example. We must give shape to our solidarity in the form of the concrete and effective BDS efforts. Boycotts were an essential part of our own struggle against colonialism, they brought down the South African apartheid regime, and they will break the back of Israeli colonization, occupation and apartheid. We stand in vigil, demanding justice for Ahed. We urge women’s and other grassroots movements in India and across the world to do the same. As Ahed braves Israeli prisons, we must send her a resonating message of support and love. Let that message be one of resistance, of people’s power and of BDS. India’s long history of solidarity with Palestine is increasingly translating into growing Indian support for the BDS movement for Palestinian rights. Israeli Prime Minister Benjamin Netanyahu’s recent visit was met with protests in various Indian cities, including New Delhi and Bombay. The 10 million strong Indian women’s movement joins the 16 million Indian farmers and agricultural works represented by the All India Kisan Sabha (AIKS) in supporting the BDS movement for Palestinian rights. AIKS announced its support for the BDS movement in in October 2017, resolving to document and resist the Israeli corporate takeover of Indian agriculture which undermines the interests of Indian farmers and funds Israeli military occupation and apartheid in Palestine. In 2017, the Delhi Queer Pride and the Queer Conversations forum in India committed to exposing and resisting Israeli government-sponsored propaganda campaigns to make cynical use of LGBTQI culture to mask, or “pinkwash”, its ongoing violence against the Palestinian people.